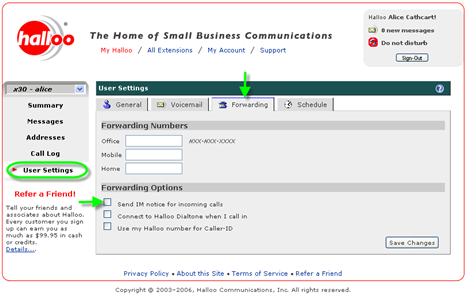 Halloo - How does call-forwarding work with Instant Messaging notification? How does call-forwarding work with Instant Messaging notification? Instant Messaging notification gives you the ability to receive IM popup notification on your computer desktop for incoming calls. In the IM popup, you will see who is calling, and have the option of re-routing the caller to a specific forwarding destination or to voicemail. In order to use IM notification, you must have a Jabber compliant client installed on your computer (see Support section entitled IM Notification for additional information on how to setup IM notification). Next, you must configure your extension with the Jabber-ID address of your client. Login to the My Halloo website. Click [Save Changes] to update. 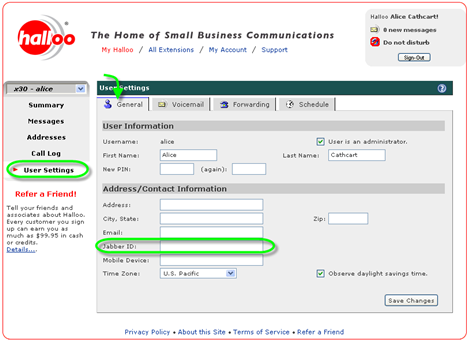 Click the “Send IM notice for incoming calls” checkbox in the “Forwarding Options” section.